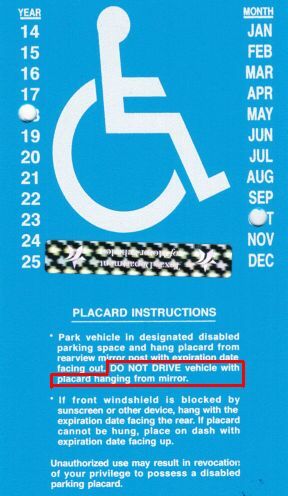 How often do you see someone driving around with the big, blue (or sometimes red) disabled parking placard hanging from their rearview mirror? If you’re like me, probably all the time. If you’re one of those people doing that, then you’re doing it wrong. Besides the fact that it explicitly says “DO NOT DRIVE vehicle with placard hanging from mirror” in the instructions on the back of the permit (yes, you’re supposed to take the time to read those words there), and although it’s not specifically illegal, it should be common sense that leaving something that big on your mirror while driving blocks a non-trivial portion of your field of vision, an inherently dangerous proposition. Admittedly, it’s maybe 10% or so of your view, but something could be in that area that makes all the difference, so why take that chance? It only takes a couple of seconds to take it down from your mirror before driving and put it back up there when you park in a reserved spot. In my previous tip, I discussed not blocking intersections. Today, I’ll discuss a time when it’s okay to wait in the intersection. 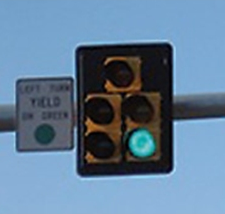 Sometimes you’ll come to an intersection where you want to turn left and there’s a flashing yellow arrow or a circular green signal but no green arrow at the time you want to turn. In this situation, I usually see people dutifully wait behind the stop line. Then the light turns red and they’re still sitting there. Even worse are intersections that don’t have a protected left arrow at all– I’ve seen people wait behind the line through multiple cycles because oncoming traffic is too heavy to allow them to turn. Occasionally they’ll even give up. Instead of waiting behind the line, the best thing to do if you need to wait to turn left is to move part of the way into the intersection and wait there. Then, if the light turns red before you’re able to turn, the oncoming traffic will stop and you can complete your turn. Comments Off on DRIVING TIP #2: Don’t block the box! This week, San Antonio police began targeted enforcement of the state’s law against stopping in an intersection. 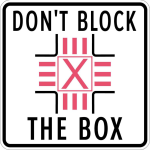 The stepped-up enforcement is part of a pilot project called “don’t block the box”, where the “box” is the intersection and adjacent crosswalks. 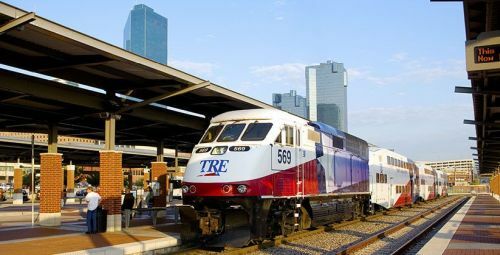 The program is modeled on similar programs in other cities. Ten problematic intersections all over San Antonio are part of this pilot project and have had signs like the one shown here installed. (Understand, though, that the law applies to all intersections, not just those marked with signs.) This is a statewide problem, so keep reading even if you’re not in San Antonio. For this first bite-sized driving tip, I’m picking a topic that’s not even discussed on my Texas traffic laws page— scan the road. Driving down the right lane of a major street recently, I crested the top of a hill and immediately saw a stalled truck in my lane nearly a mile down the road. Traffic in both lanes was light enough to easily change lanes, so I moved to the left lane as soon as I saw the hazard. There were two other cars traveling in the right lane ahead of me and BOTH of them continued down the lane until they were nearly on top of the broken-down truck. At that point, they had to hit their brakes and make a sudden lane change to avoid hitting it. While that page was initially intended to highlight common questions folks have, it’s become quite comprehensive over the years. If you take the time to read the whole thing, it’ll take you while and you’ll feel like you’ve been drinking from a fire hose. So, I’ve decided to parcel-out some of the topics from that page in smaller doses here over the next few months, along with some additional tips that aren’t covered on that other page. If you’re interested, I’ll announce postings on my Twitter and Facebook pages or just check back here periodically. Comments Off on What drives income inequality? If we agree that too much wealth in the hands of too few stymies the economy, and even democracy, what do we do? With the middle class losing ground despite healthy corporate profits, politicians and pundits gladly harp on tax rates, migrant populations and other soft targets to prescribe solutions for growing income disparities. I decided to see what the data says. Using World Bank datasets, I analyzed more than a dozen factors to see how they might relate to income distribution, defined here as share of income held by a country’s top 10 percent of earners. Comments Off on Not gonna use the HOV lane? It still benefits you! 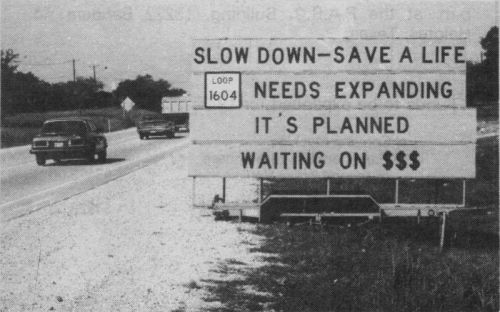 TxDOT is preparing to build San Antonio’s first two high-occupancy vehicle (HOV) lanes on I-10 West and US 281 North. 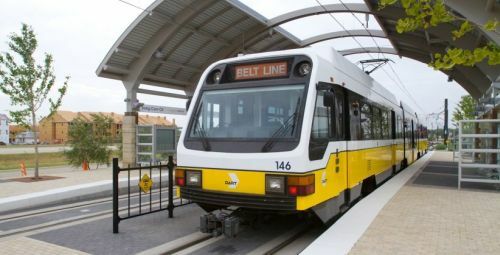 Construction of both is scheduled to start this year. One comment I frequently hear about HOV lanes is from people saying they won’t use them, so they won’t benefit from them. A corollary of that is that people who won’t use them don’t think their tax money should be spent on them. As is often the case, both of these viewpoints fail to see the bigger picture.